On Thursday, some of Current’s early clients spoke about their decision to work with the new energy services company backed by one of the biggest names in the business. JPMorgan Chase announced after the closing bell that it had chosen Current to do the largest single order for a light-emitting diode (LED) installation because of the company’s staying power. It will install LEDs at about 5,000 branches spanning 25 million square feet. The move could cut JPMorgan’s lighting costs by more than 50 percent at the branches, but “the energy savings are secondary to greenhouse gas emission reductions,” said Granville Martin, JPMorgan’s managing director of sustainable finance. GE’s Current combines its commercial and industrial LED lighting, solar, energy storage and electric vehicle businesses with the predictive analytics of its industrial internet platform, Predix. Many early customers are starting with lighting but have chosen Current because the company can do so much more. "For many large energy customers, lighting still seems to be the gateway drug into 'smart' building energy management," said Steve Propper, director of grid edge for GTM Research. "While these one-time savings shouldn't be marginalized, there is much more money on the table for those organizations willing to take risks and explore new value streams, particularly investments in distributed energy resources or breaking into new customer-service offerings altogether." “The color is good, the Kelvin is good,” Randy Gaines, VP of operations in the Americas for Hilton, said of the quality of LEDs in today’s market. “But I like to do the heavier lifting where it makes sense to do it,” he added, whether that’s a combined-heat-and-power project or a power-purchase agreement for solar. Whether seeking the business of a Fortune 500 company or a municipality, partnerships are increasingly important for LED platforms as LED adoption becomes mainstream, and apps will be layered on top in the future. "LED commercial usage is anticipated to grow from 28 percent today to 95 percent by 2025, unlocking tremendous value for our customers to reduce energy cost and complexity in commercial enterprises," said Sylvester. Cisco and Cree recently announced a partnership to bring Cree’s SmartCast LED lighting platform over Cisco’s digital ceiling framework that operates over Ethernet. Silver Spring Networks also just announced it is developing a networked LED streetlight solution for Philips Lighting that could be the basis of a smart cities infrastructure. Current also announced an agreement with Intel for smart cities proposals. “We’d be fools not to do it,” Hilton's Gaines said of the switch to LEDs. 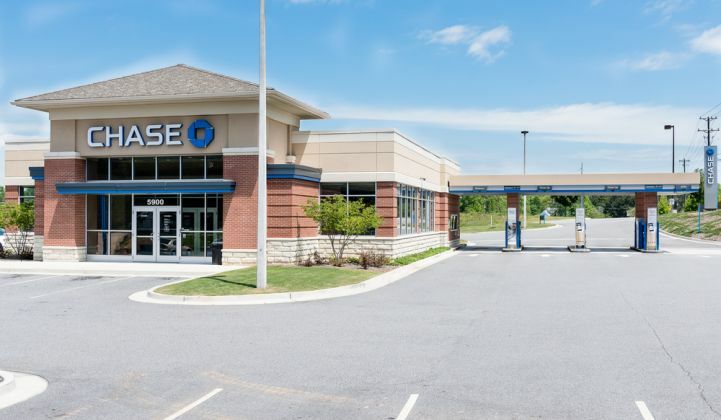 JPMorgan's Martin agreed that the switch was not only the obvious course of action to maximize energy savings, but also made sense in terms of delivering a better experience in the branches. By conceptualizing LEDs as only one step of the process, companies like JPMorgan Chase and Hilton highlight the bleeding edge of how energy services are evolving. “What I like about GE is they get the analytics behind it,” Gaines said of Current's approach to using big data to deliver results. These large global corporations already have seasoned professionals who are thinking about energy use and procurement. “We built visualization into our energy data, but how do we take it to the next level?” asked Brian Weldy, VP of FacilitiGroup Infrastructure at Hospital Corporation of America (HCA), another early client of Current. For his company, it is increasingly about tying together health outcomes and facilities performance, as everything from lighting to temperature can influence health outcomes. It’s a daunting challenge to implement energy projects that cut across departments, whether in a corporation or a city. As options for distributed generation, demand-side services and deep efficiency proliferate, corporations like HCA are looking for partners to help them navigate the waters. “How do you present the right opportunity to the right people at the right time?” Weldy asked of committing to more sophisticated energy projects. “Going all in is a big commitment from a lot of people.” Even with the right and willing partners, it is a challenge companies like Current face in delivering increasingly compelling outcomes -- and not just incremental upgrades like efficient lights. It's a question John Gordon, chief digital officer of Current, mulls openly: "How do we drive energy with a purpose?"